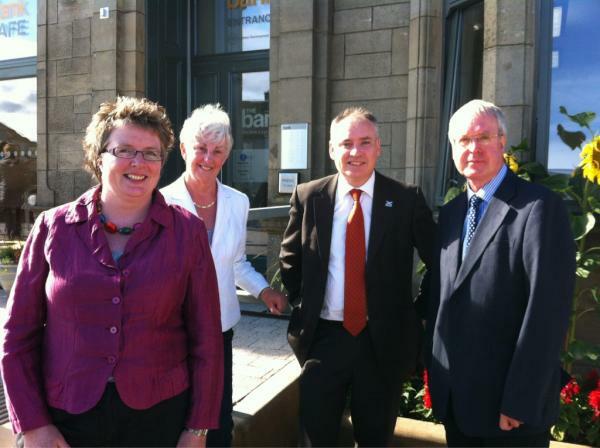 Pictured with Richard Lochhead At the Old Bank in Neilston are Board members of the Land Reform Review Group left to right are Dr Sarah Skerratt, Dr Alison Elliot (Chair), and Professor James Hunter. · the relationship between local and national interests. · make its own independent assessment of this advice and of the varying (and possibly conflicting) views put to it. · a draft Final Report to Ministers by December 2013. · indication of how the impact of the recommendations on land reform might be measured, monitored and otherwise assessed. This is a welcome and wide-ranging remit. I no longer agree with my statement above. It appears that the remit has been misrepresented as being wide-ranging and radical. See my blog of 10 June 2013 for analysis. Surprisingly wide ranging. With such a blank canvass to write on, I’m looking forward to your submission to the Group immensely. You’ll be able to set out some radical suggestions without having to be distracted by side issues like succession and tax (which are only relevant to *land* reform when tackling land law or policy head on is not an option). Very encouraging comments from chair Alison Elliot acknowledging both significance and scale of task. I’m delighted that the Review Group has cleared its first serious hurdle – getting Andy Wightman’s support for and approval of their remit! I love blank canvasses and I’m looking forward to the exploration of creative and diverse land /people relationships beyond the stale and stained Laird debate. Daye Tucker’s predictable comment on the Laird’s debate being stale and stained ….Yes stained with the blood of our beautiful wild animals, and stale with the stagnation of our land and depopulation of our rural communities. It’s the lairds and their selfish attitude to land that has got us into this situation, and it’s hilarious that they think they can be part of the solution….have a read of Scottish land and estates website welcoming the land reform group ! They must be shaking in their boots and their marbles rattling in their mouths ! but I bet we won’t hear again the praise for our first minister they showered on him after their AGM.